Frequently hard to diagnose, bipolar disorder tends to be a moving target. While a physician only gets a brief look into the life of the patient, it is often up to family and friends to provide the necessary context that can help lead to a proper diagnosis. If you or a loved one have been experiencing irrational or erratic behavior, it could be a sign of bipolar disorder. What signs should you be looking for? Throughout this article, I will be sharing my personal experience and how the symptoms manifested in my life. Disclaimer: This post contains my experiences. I am not a mental health professional. If you see signs in yourself or a loved that could signify the presence of bipolar disorder or another mental illness, seek professional help immediately. Bipolar Disorder tends to wreak havoc on the work environment. Symptoms can lead to low productivity or strained interactions with colleagues. Workmates often spend more time with the individual than anyone else, making them most alert to unusual or troubling behavior. My experience was the opposite. In the final days leading up to my correct diagnosis, I became a workaholic. It was not uncommon for me to work 80 hours in a week while maintaining a full social life. The lack of balance was a clue as to how bad things really were. It is all too easy to call men “grumpy” as they get older. Many of them are. If the irritability comes on suddenly, is uncharacteristic, or last for many days, it could signify something else going on. Bipolar disorder can rear its ugly head through outbursts and irrational ranting. Left untreated, this growing anger can lead to money or even legal troubles. Bipolal irritability and anger never caused me to have any legal issues. It did strain many relationships. Friends started to refer to me as Dr. Jekel and Mr. Hyde because I would be the life of the party one minute, and then some small, unimportant thing would happen and I would fly into a tirade. I would get so angry that there was no calming me down. 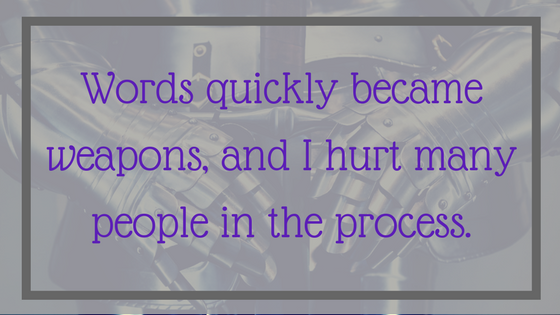 Words quickly became weapons, and I hurt many people in the process. On the surface, a great mood should be a good thing. Someone who suddenly experiences several days of extreme joy and high-energy may be signaling something is wrong. Bipolar disorder patients often describe mania (or hypomania) as Superman Syndrome or the feeling that you can do literally anything. The high spirits are typically uncharacteristic and may come with visions of grandeur and impulsivity. What is a manic episode? For me, I tended to stay on the manic side. Many of my close friends did not know me well enough at the time I was at my worst. I had moved 900 miles from my family and so had little to no history with anyone. Without that history, many never noticed that anything was amiss. The sign that should have been a red flag was that I seldom said “no” to anything. I was always ready to go do something fun, even if I had already worked 16 hours that day and had more work to be completed when I got home. Disclosure: This site is a participant in the Amazon Services, LLC. Associates Program, an affiliate advertising program designed to provide a means for sites to earn advertising fees by advertising and linking to Amazon.com. This post also contains affiliate links. Any purchase made through such links will award me a small commission or referral fee, at no extra cost for you. It’s how I keep the lights on. Turning to the flip side, depression can also be a signal of bipolar disorder. More than the simple blues, depression lasts for days or weeks and can disrupt relationships and social interaction. Depression may come on suddenly and then disappear just as suddenly only to return later. I once described it to a friend as walking across a frozen lake at night. 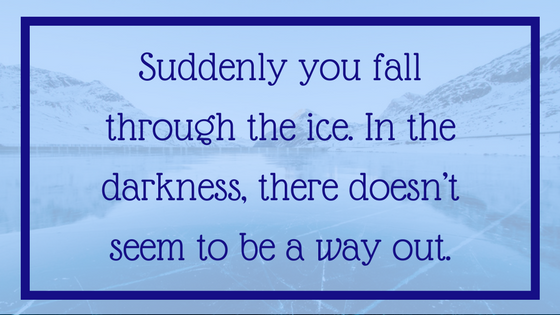 Suddenly you fall through the ice. In the darkness, there doesn’t seem to be a way out. The weight of depression pulled me down. When I cycled that way, I would spend days in bed and away from people. I would even park my car at a nearby store and walk home so no one would know I was there. Mania can bring on a sort of attention deficit disorder. Ideas come so quickly that it becomes hard to complete one task before you have a great idea for the next one. Lots of projects may be started. When bipolar depression takes over, all motivation slips out the window. In an instant, everything becomes impossible and unworthwhile. Little matters as the defeatist attitude takes over. Someone I know well with bipolar disorder would often take on mountain-like tasks in her mania. One day, completely out of the blue, she took a hammer to her living room wall. She decided she no longer wanted the wall there, so it would have to go. I like writing, so I have started many novels and stories in the manic state. Sadly, none of them are finished. It is hard to see this as a sign in others unless the behavior is extremely unusual. But you may recognize it in yourself. One of my friends once bought three cars in the course of a week. He didn’t have the money to even pay for the first one. Bipolar disorder may express itself through unusual or impulse purchases. Or it may manifest through improper actions or risk-taking. If you have a sudden desire to go hitchhiking or skydiving or to go home with random strangers, likely something is wrong. Personally, I amassed thousands of dollars of debt from unnecessary purchases. 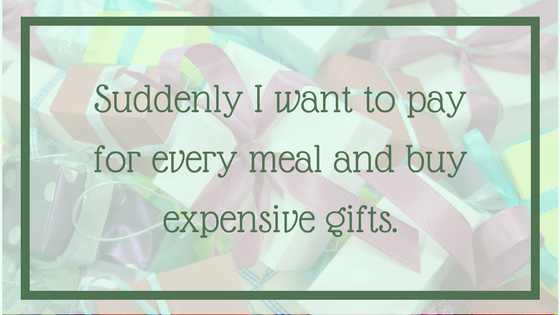 Generosity becomes extreme for me and suddenly I want to pay for every meal and buy expensive gifts. This is one that you will know when you see it. Rapid speech doesn’t refer to that like a teenage girl when she is excited to tell you about some boy or outfit she wants to buy. This rapid speech is so fast that it may be hard to follow and often will have many, many topic changes. Subjects may change midsentence and you might get the sense that the person could not stop talking if they wanted to. One of my friends told me I got “crazy eyes” when I got this way. I was never sure what she meant until years later when I was properly medicated and saw this behavior in someone else. If you ever see “crazy eyes,” it is impossible to mistake. Hand-in-hand with rapid speech can be an intense flight of ideas. This is a more internal symptom that one must recognize in themselves. In children, it may be more obvious as they struggle to get out words coherently because of the rapidly changing thoughts they are experiencing. 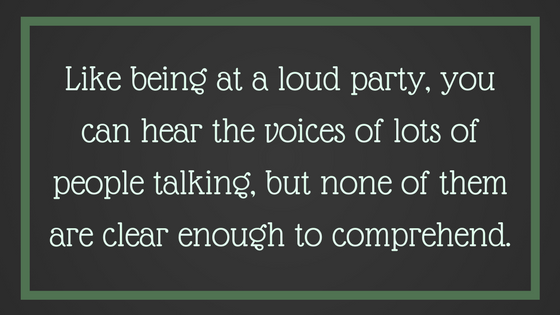 For me, it’s usually like being at a party, except at a party you tend to only focus on the conversation that you are contributing to. 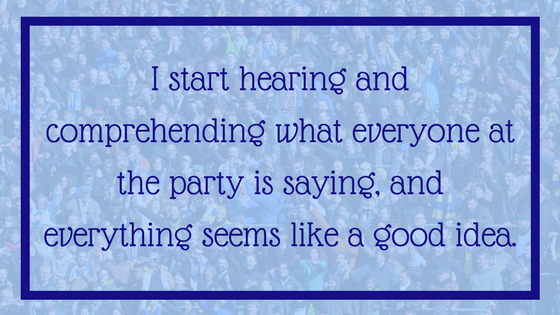 In my head, I start hearing and comprehending what everyone at the party is saying, and everything seems like a good idea. The speed of the thoughts is usually so high that I cannot write or talk fast enough to keep up. Problems with sleep can manifest in two different ways, but both tend to be extreme. On the one side, you may want to sleep all the time. You may feel that no matter how much you sleep, you are still exhausted and need to sleep more. The flip side is usually no sleep. This is where I often resided. The last two weeks before I was ultimately hospitalized, I did not sleep one minute. If you don’t have bipolar, you will think that is an impossibly inaccurate statement. I wish it was, but it is true, as my friends and family will attest. The oddity about not sleeping is that after a day or two you no longer feel tired. I didn’t have the need to sit down and rest or sleep. Some strange energy source had inhabited me, and I was not going to need to sleep ever again. Not sleeping brings its own litany of problems. Psychosis, hallucinations and other difficulties develop quickly. To use the party analogy again, bipolar may produce an abundance of mental noise. The difference between mental noise and a flight of ideas is that mental noise, at least in my experience, tends to be incoherent. Like being at a loud party, you can hear the voices of lots of people talking but none of them are clear enough to comprehend. Mental noise can plague you with unrelenting repeated thoughts. Even on my healthiest days, I still will replay entire conversations over and over again in my head. Then I will think about how the conversation should have continued and play the entire conversation again. Then change something else and play again. For me, I can also experience this with songs. A certain song, and usually only part of the song, will start playing in my head. It then repeats incessantly no matter what I do to try to stop it. Even listening to or singing another song is ineffective. Many nights’ sleep has been stolen by this type of noise. You may also develop a sensitive to loud noises. Fortunately, the right medicine should make you sleep at some point regardless. When I finally started on one of the meds I take now, my doctor advised me to take it right before bed. I didn’t believe the medication would make me sleep, so I took it before dinner. I ended up passing out with my fork still in my hand. Usually, sleep is exactly what you need to reset your brain and turn off the conversation loop. Sudden changes in weight can signal the possibility of bipolar disorder. Mania can lead to no appetite or being too busy to eat. Depression can bring on excessive eating. When I was hospitalized, I was down to 116 pounds. I am 5-feet, 9-inches tall for some context. During the next three years, while struggling to find the right medication combination, I gained almost 100 pounds. If people noticed, no one was talking about it and what it might mean. Frequently referred to as “self-medicating,” turning to drugs or alcohol tends to be a go-to for those with untreated mental illness. With the list of symptoms above, it is no wonder that someone would try to find their own means to fix the problem. 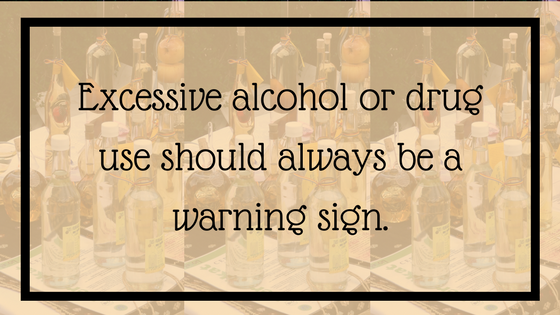 Excessive alcohol or drug use should always be a warning sign. 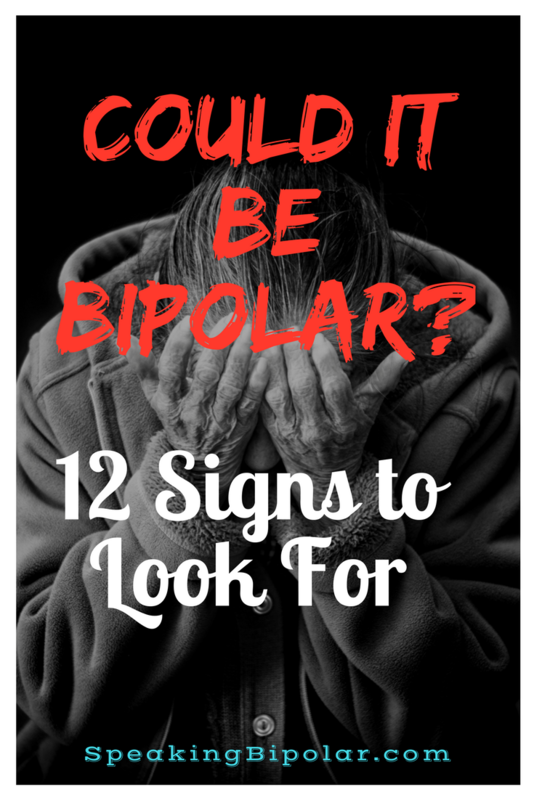 Even if you are not bipolar, they are unhealthy behaviors and should be addressed appropriately. Though more than one well-meaning friend tried to pin the “addict” title to me, I was fortunate enough to never develop an addiction. That is not to say that I did not abuse alcohol from time to time. It never became a need for me and was always something I could take or leave. It’s important for me to reiterate here that I am not a mental health professional. 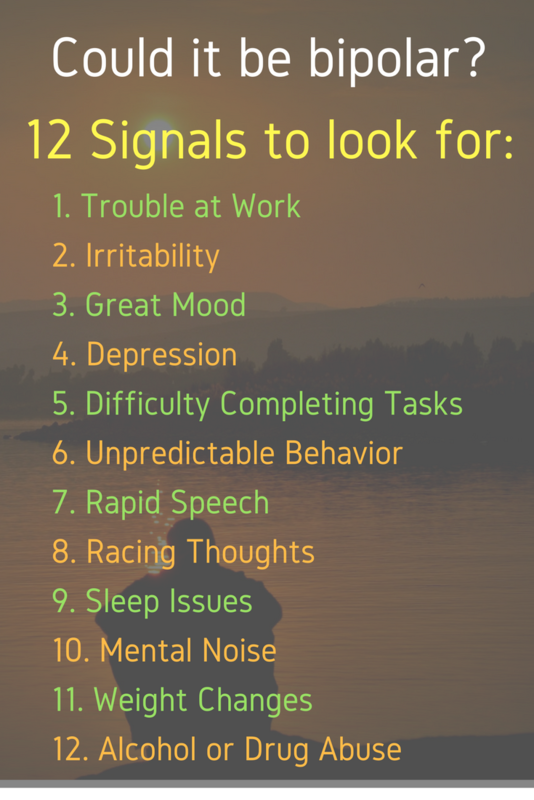 If you or a loved one are experiencing any of these symptoms, please take the time to talk with someone qualified to evaluate your situation as soon as possible. Only a medical professional can determine how to know if someone is bipolar. The Bipolar Disorder diagnosis does not have to spell gloom and doom. You can continue to live a productive and happy life. The key is getting the right help and the right medication. I was hospitalized in 1995. Though I have had a few very rough patches, I have never had to be hospitalized again. With the exception of only a few months, I have been an active and productive member of society during all the years since. There is hope. The symptoms listed above do not have to control your life. Take the right step and get help today. If you enjoyed this post, please take a moment to share it on Pinterest or other social media. Thank you! Symptoms of bipolar to look for in your loved one. One of the best lists I’ve seen besides my own lol. It took an estimated 20 years for me to get diagnosed. I was given a plethora of different antidepressants & other meds during that time but no diagnosis. I also self-medicated with alcohol for 20 years. The one thing so many disregard is family history. My mom’s sister and brother were both diagnosed Paranoid Schizophrenic, my mom was hospitalized several times for mental health reasons but never received a diagnosis, 2 of my nieces are Bipolar, 1 cousin is Schizophrenic and another is Bipolar. All on my mom’s side of the family. Also alcoholism and drug addiction. It’s too much to be coincidence. The people around me often thought I just had too much coffee. I would talk louder and faster, go on spending sprees that eventually lead to bankruptcy, I’ve hopped on planes to meet musicians, and one behavior that a lot of people don’t like to discuss that I had an issue with is promiscuity. It was only while drunk but I was drunk daily for years. If I was in a depressive episode I felt an aching hole in the middle of my chest and worthless. Somehow I thought if I could get a person to like me the hole would go away. I started drinking so early I never learned how to date or talk to men sober. I only knew what I learned from the older men I drank with which wasn’t good. I do think it’s normal on bad days to not necessarily think about suicide but maybe being somewhere else? Somewhere you’re accepted for who you are, you don’t have to walk on eggshells or pretend anymore, I can stop saying “I’m sorry” every 10 minutes, and I don’t feel the need to explain anything about myself. Thank you for your comment. I’m glad you liked the post. The road to diagnosis is often long, and then there is often a longer road in trying to find the right medicine or combination of meds. I hope this means you are doing well now. I’ll take a moment later today to look at your list. Have a wonderful day. This was so informational. I don’t know a whole lot about bipolar disorder so reading this did do a lot for me. It gave me more in depth info than when I google it. Great post! Thank you for saying that. One of my goals is to increase awareness. This was quite informative, although you only named a few cues to look for, they can help spot troubled youth and adults. Bipolar disorder is more common than we think, and I am sure it probably goes mistreated for other mental illnesses. You are exactly right. Thank you for taking the time to leave a comment! Interesting and well written read. Thanks for sharing man! This is a great article. I wish more people would talk about bipolar and Autism and not shame them for having this. I agree. In time, I will be adding content for Autism and Asperger’s as both conditions are in my immediate family. Thanks for commenting. I enjoyed this article! I was a Mental Health Counselor for a couple years, and worked with several bipolar clients. I think this is a great list to read for those struggling with mania and/or depression, and haven’t yet had the opportunity to meet with a professional. I especially enjoyed your personal examples, as those might help someone determine what the symptoms of bipolar might look like in real life. Thank you so much for leaving that comment. It’s a struggle as a new blogger to know if someone will read and connect with your words. I appreciate the validation. Its a great post to read, so interesting and informative, thanks for sharing! A very positive and well written blog. Needed this as my daughter struggled to find help. Every day is a challenge and every day I applaud her for facing this reality and living her best life. Interesting post, it’s nice to have this information. Thank you for being candid about your experience. Hi Mark, Thanks for commenting. I follow you and Grizz on Twitter. Always love seeing the pics and good info. Great post. We should all be aware that each of us is different and yet similar in many ways. I suffer from PTSD and it has ruined my professional life. I knew a bipolar woman years back. She was an actress and incredible, but her problems destroyed her marriage and potential career. I’m sorry to hear you are dealing with PTSD. Disorders like ours can wreak all kinds of havoc. I hope things improve for you. Thanks for commenting. Thanks for liking and following Sister Grumpy’s Church Blog. I think you are writing an important blog here. Back in the 60s and 70s, no one knew much about autism. My oldest son was not totally asocial, but he was such an odd child (going around making machine noises, for one thing), that he did not have any friends, and was a problem for teachers at school. They thought he was brain-damaged. He did well in spelling, math, and science and liked anything mechanical. When computers came along, he quickly learned how to use and repair them, but he had to get a GED to finish his high school education. He was at home with electronics and technology, but had trouble finding and keeping a job. A year before he died at only 37, he finally found that he was a very good OTR truck driver, and he made good money and got safety awards driving. We never knew until the past few years that there were “Places” on the autism spectrum for people with normal intelligence, good living skills, but poor social skills, and difficulty disciplining their own emotions. I’m so sorry to hear about your son. I’m sure you miss him every day. Autism is very misunderstood. I have both a nephew and close friend with Asperger’s, and I feel blessed to know them. Thank you for sharing your experience. Most everyone has some of these symptoms. It must be quite difficult to make an accurate diagnosis. I’m so sorry for the late reply. Somehow WordPress reader never showed your comment until today. Yes, you are right, bipolar is very hard to diagnose, especially since a mental health professional often only sees the patient for a few minutes at a time. That’s why it’s so important for family and other loved ones to be involved in the treatment. My doctors diagnosed me with several things before bipolar because I seldom seemed “unsettled” in their presence. It was only after I was hospitalized that it was clear that my struggle was with manic depression. The right diagnosis and the right treatment are possible. Lisa, I’m sorry to hear about your diagnosis but know that you are not alone and there are many, many things today that can help you lead a successful life even with bipolar. Thank you for taking a moment to leave a comment and to share your experience. I hope you’ll stop by again. This is an excellent article. Thanks for sharing and raising awareness about this important issue. Thank you so much for saying that, and thanks for commenting. This site is a participant in the Amazon Services, LLC. Associates Program, an affiliate advertising program designed to provide a means for sites to earn advertising fees by advertising and linking to Amazon.com. This post also contains affiliate links. Any purchase made through such links will award me a small commission or referral fee, at no extra cost for you. Monday Motivation: Who Do You Want To Be? A Blogging Odyssey: Week 2 – How Long Should Your Blog Post Be?